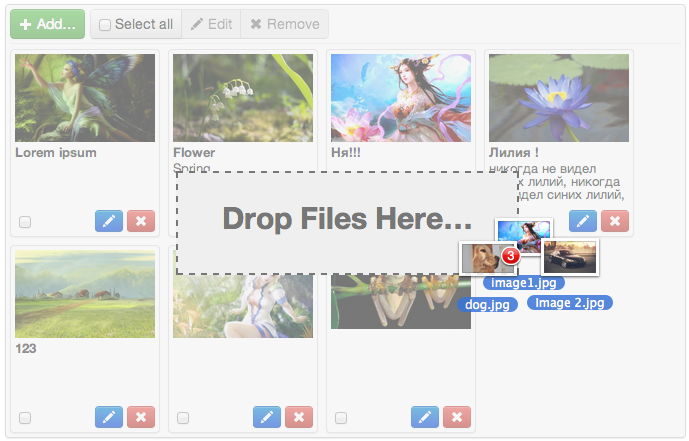 Checkout source code to your project, for example to ext.galleryManager. Install and configure image component(https://bitbucket.org/z_bodya/yii-image). Add GalleryController to application or module controllerMap. Using gallery behavior is possible to add gallery to any model in application. Note: to run in migration you should define 'webroot' path alias. November 18, 2012 - Added CSRF protection support. Octover 23, 2012 - Fixed mistake in db schema that can cause upload errors on some mysql configurations. August 7, 2012 - Fixed bug with photo select. August 2, 2012 - Added ability use few gallery manager widgets on same page. Moved styles and scripts from view to separate files, added minified script versions. July 29, 2012 - Fixed bug in behavior when tring to insert new record. July 24, 2012 - Begin using jquery.iframe.transport to make ajax file upload in older browsers. Finish work on GalleryBehavior. Remove form tags from widget to make it possible to add it into anouther form tag. July 13, 2012 - Fixed bug(reported by DrMabuse on bitbuket). Bug was in saving order of recently uploaded images. GalleryManager and its behaviors do not have a method or closure named "recordCachingAction". ext.galleryManager.GalleryController also got error unable to find the requested action "index". Or this extension for use as behavior? You can not use GalleryManager in controllerMap - it is widget, not controller: use GalleryController. GalleryController has no index action because it is only for ajax calls from GalleryManager widget. "Or this extension for use as behavior?" No, you can use it anywhere . There is an example above, how to use it with separate gallery model. Please add support for tablePrefix. I user prefixes and got error when use this manager. I don't want add this to models, because this will cause errors for all people who do not use tablePrefix(for ex. me). I think, in next version, I will completely remove bindings to concrete database tables. I want to do this, in order to allow use custom tables for gallery and photo. This is required to add ability for custom photo attributes, and to avoid need in separate table for gallery params in cases when using GalleryBehavior. 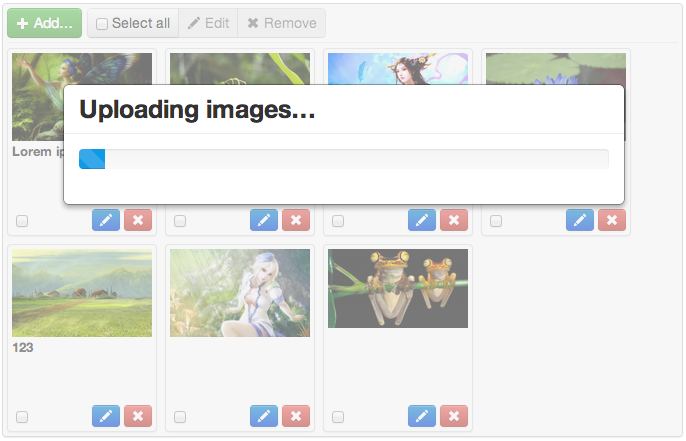 When I upload small image, extension resize it for all $versions of image. Need to check for the original size of image, and then resize, if it's larger then in $versions sizes array..
Each "version" of image is a list of actions what we need to do with original image by Image component in order to get required effects. So if you need contitional resize - you need to add method for that to Image component and use it in your versions configuration. I have fixed this bug few days ago(but forgotten to update extension here)... - the problem was because of difference in html templates on client and server sides. When I use it on my index.php, when I add a image, the message from twitter bootstrap appears: "Edit Information" with save and close buttons, but nothing happens. What can I do? 1) check that you have correctly defined the controllerMap. What is the right controllerMap if I want to use this widget in application but not in the module? You can use application controller map. 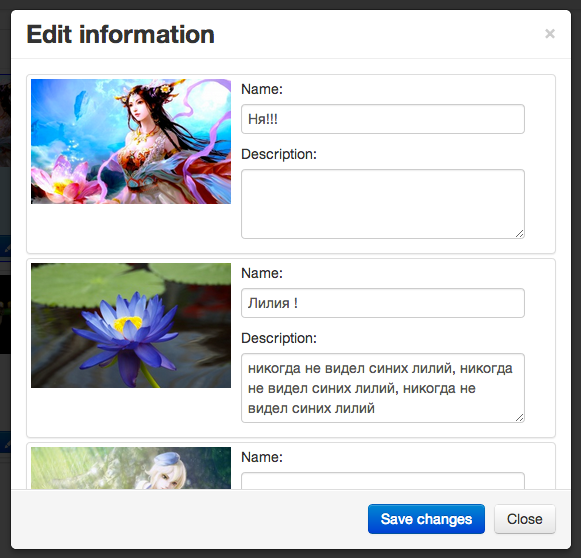 How to add any wysiwyg for photo description area ? By now this is not supported by extension. I know about need in features like this, and may be later, I will modify extension in order to add more flexibility(especially for possibility to have models with different attributes for different gallery type and custom forms to edit them). Modify event handler for $('.save-changes', $editorModal).click, to properly update photo element when information was changed. I want to use this extension, but can not configured. Is there a detailed example? Seems you need to include twitter bootstrap styles and scripts to your page. P.S. For such questions, there is forum. Excellent extension!. The only missing feature is the possibility to set a image limit. How to use widget by ajax request. Thanks for this Great widget.I have setup widget as mentioned in doc and it is working properly on my site. Problem arises When i try load widget by it ajax call.It shows only add, select, edit and remove button only. No preview of the image available.When i click add it popup windows explorer and after select file when i click open, It does nothing. Can you Please guide me how can i achieve this widget working by ajax request? re: How to use widget by ajax request. Can I select only one picture from gallery? Hi, if I want to choose main poster of the article can I choose only one image from uploaded images and get it's url in any field? Hi, I fork the repo ... but in console git clone get me repository not found !!! Why ? It is because of missing twitter bootstrap scripts. P.S. please, use forum or issue tracker on bitbucket for such questions. It would be useful in some cases, but in most of them probably no. Anyway, if you need it - there is a branch with this functionality. Is there a version for yii2? Hi, Is there a version for yii2? It is planned(already started porting), but not done yet. It would be great mongo support in the Yii2 version. Thanks!. As mentioned in below comments, main repository at BitBucket is not accessible and does not provide a code to clone. You should use GitHub repository at https://github.com/zxbodya/yii-gallery-manager or download .tar.gz file from this page. There's a nice looking and (nearly) ready to use demo application found at BitBucket (this time repository is cloneable): https://bitbucket.org/z_bodya/yii-demo-blog. 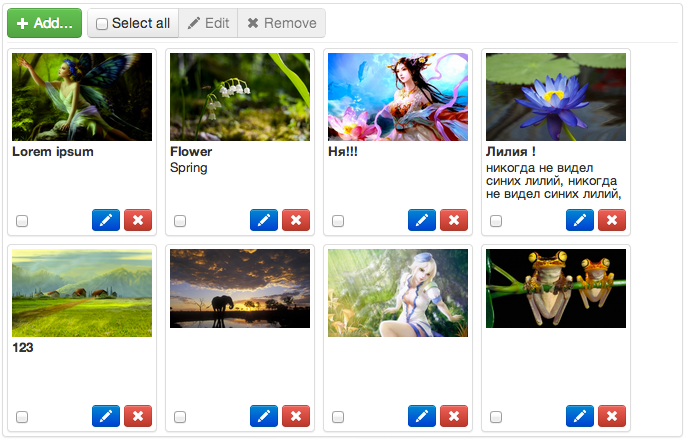 It contains Gallery Manager and other extensions made by this author. When you get it running, don't be surprised, that you see no sign of gallery manager at first. To see it in action, you should edit any post (or create new one), because gallery manager widget has been included only in this view (and in post view in frontend, once particular view contains some gallery). Note, that cloned code does not contain assets folder and protected/runtime folder. You should create these two in point 2.5 (before changing folder permissions) of instruction mentioned in BitBucket repository. Yeah, sorry for my bad day and for my bad attitude as well, that was rude. Sorry. If I'm not mistaken, you're trying to use HTML5 or browser or iOS build-in camera capture feature. It should work here, if it works on other extensions / forms, by just adding accept="image/*;capture". I don't know, why this is not working here, but I fear, that since this question is iOS-specific, then there will not be many people here able to help you. Anyway, you should rather ask this question on Yii forum. Comments shouldn't be uses for asking technical questions. I know, that many people here ignores this, but that is fact. Comments should be used in general for providing feedback (bug reports, feature requests) not for technical questions (how to do this, why that isn't working).